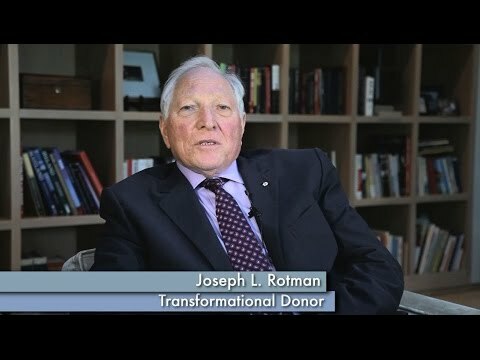 A decade in the making, the Rotman School of Management’s expansion is the outcome of the tremendous generosity of its many donors, volunteers, and friends. Thank you to everyone who has contributed to this major milestone in the Rotman School’s evolution as a leading centre for management education and research. The Rotman Expansion, designed by Kuwabara Payne McKenna Blumberg Architects (KPMB), was the winning scheme in an invited design competition held in 2008. The nine-storey-high project is seamlessly integrated with — and doubles the size of — the Rotman School’s home on the University of Toronto’s downtown campus. It is also connected to an existing Victorian residence. KPMB conceived a vertical campus to fit the varied program of tiered classrooms, study rooms, research centres, study lounges, and dedicated student spaces on a tight urban site. The project features many spaces for gathering, including the Event Hall, a state-of-the-art teaching and meeting space for the Rotman School, the University of Toronto, and Canada’s business community. spectacular views of the University’s campus. Terraces with green roofs and a courtyard provide access to the outdoors. KPMB is one of Canada’s leading architecture firms, with over 175 awards for architectural excellence, including 12 Governor General’s Medals. In Toronto, KPMB’s widely acclaimed projects include the Gardiner Museum, the TIFF Bell Lightbox, Canada’s National Ballet School, and the Royal Conservatory of Music. The core project team for the Rotman expansion comprised Bruce Kuwabara (design partner), Marianne McKenna (partner-in-charge), Luigi LaRocca (principal-in-charge), Paulo Rocha (associate/design/project architect), Dave Smythe (associate/project architect), Myriam Tawadros, Bruno Weber, John Peterson, and Carolyn Lee.